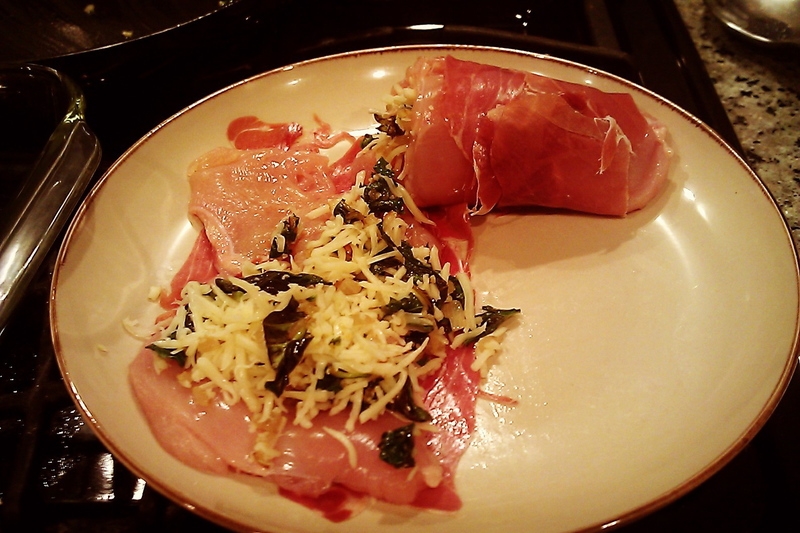 This recipe is another delicious spinoff of my Dijon Crusted Chicken Stuffed with Spinach Saute and credit to this yummy chicken prosciutto recipe goes to http://dianeskitchentable.wordpress.com/. In a large skillet heat 1 teaspoon oil to MEDIUM and saute onion until soft, 3 to 4 minutes. 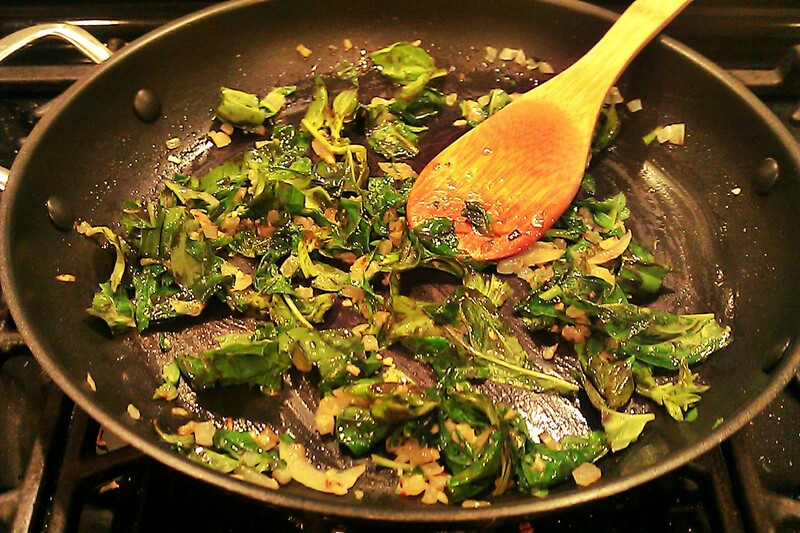 Reduce heat to LOW, add another teaspoon oil and stir fry garlic until it begins to brown slightly, 1 to 2 minutes.Increase heat back to MEDIUM, add spinach and basil, saute until spinach wilts just so. Place spinach saute into a mixing bowl – let it cool – then mix in the mozzarella cheese. Spread olive oil over all the chicken pieces. On a large plate spread a few pieces of prosciutto. 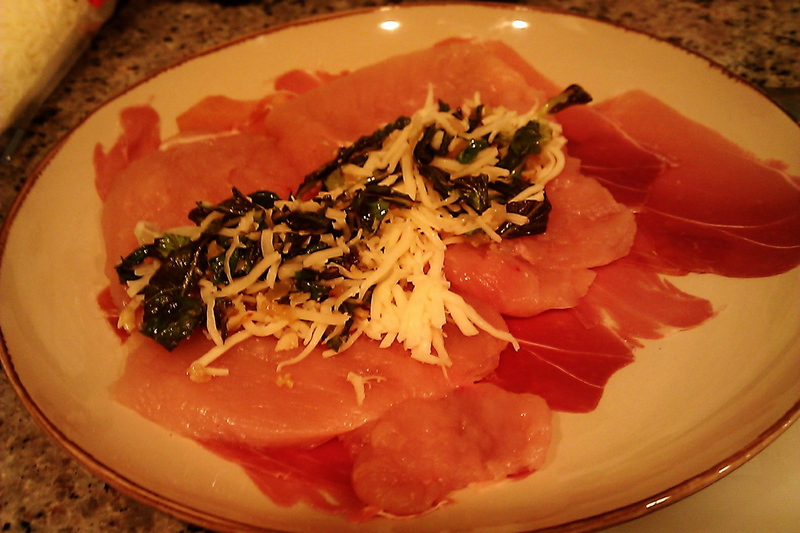 Lay two chicken pieces on top in the same direction as prosciutto. Divide spinach mixture on top of chicken closer to the end where you will begin the roll. Roll your chicken into the prosciutto. Place chicken rolls on baking sheet and loosely tent with aluminum foil. Bake on center rack 35 to 40 minutes. 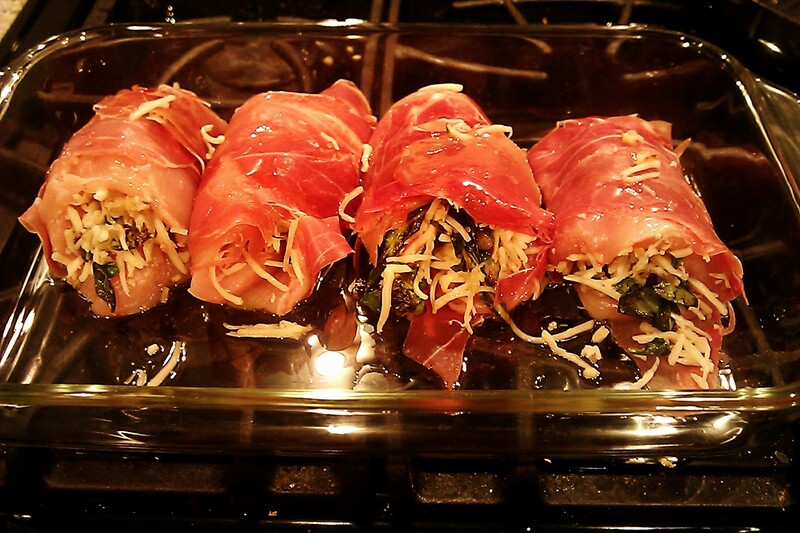 Anything wrapped in prosciutto gets my vote! LOL! We wrap it around scallops and cook in a hot pan…we wrap it around fresh asparagus and put on the grill..you name it, it’s great! Yum! It’s probably a healthier alternative to bacon too at least when it comes to saturated fat. That does sound and look extremely delicious, what a great idea. You should try wrapping proscuitto around a firm white fish, such as haddock or tilapia or Monkfish…it’s absolutely delightful! This is one of my favorites but I save a little time by cutting out that first step and just confetti the spinach, then spread everything onto the middle of the chicken. Isn’t prosciutto the greatest? No need to add salt too. The prosciutto flavors the chicken nicely.